The Trial($24.00; Sept.; 304 pp. ; 0-8052-4165-5): Following closely this year’s new version of The Castle, here is another in a series of retranslations based on “restored texts” assembled from Kafka’s original manuscripts and notes. Mitchell’s translation also proposes to replace an earlier one (by Willa and Edwin Muir) said to have been unduly influenced by the efforts of Kafka’s friend and literary executor Max Brod to “improve” the former’s chaotic unfinished manuscripts. The Trial (1924)—whose cryptic portrayal of a bank clerk detained and interrogated for an undisclosed offense has become perhaps the dominant image of modernist “absurdity”—holds up well in a version characterized by long, crowded paragraphs and virtually incantatory accusatory repetitions that confer equal emphasis on the novel’s despairing comedy and aura of unspecific menace. 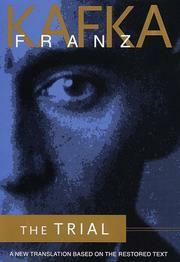 Admirers of Kafka’s fiction will not want to miss it.